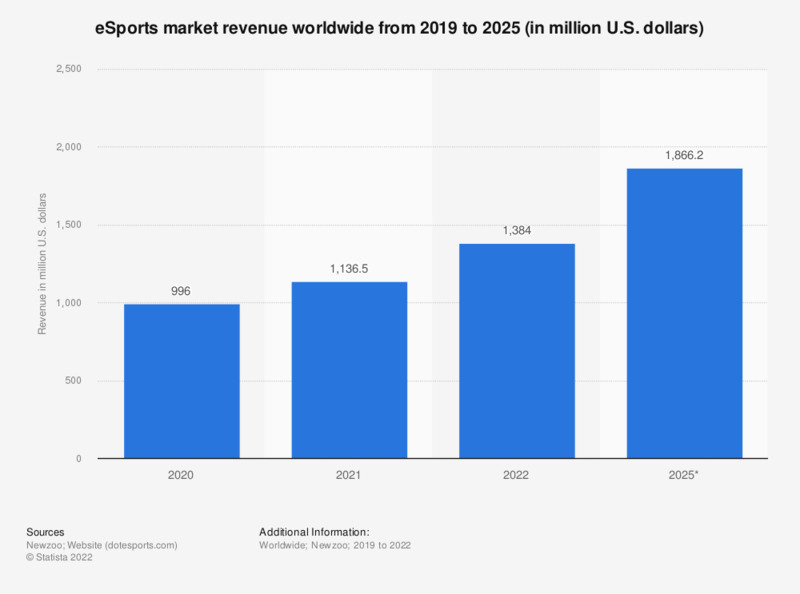 This statistic shows the global eSports market revenue from 2012 to 2022. In 2018, the global eSports market was valued at nearly 865 million U.S. dollars. According to the source's estimates, global eSports market revenue will reach 1.79 billion U.S. dollars in 2022. The eSports industry is expected to grow rapidly in the coming years. In 2017, worldwide revenues generated in the eSports market amounted to 655 million U.S. dollars. At the pace of 22.3 percent CAGR, the market is expected to generate close to 1.8 billion U.S. dollars in revenue by 2022. The majority of these revenues come from sponsorships and advertising, and the rest from eSports betting, prize pools, tournaments, merchandise and ticket sales. In terms of revenues, Asia and North America represent the two largest eSports markets. While Asia contributed close to half of global eSports market revenue, generating 406 million U.S. dollars in 2017, the North American market brought in 392 million U.S. dollars in revenue, followed by the European market at 298 million U.S. dollars.